[Resolved]Signature has to be enabled every time? CPA Elites - CPA Marketing Forum Forum suggestions, feature roadmaps and bugs Forum bugs [Resolved]Signature has to be enabled every time? I currently notice that I have some sort of a bug where every time I make a new post I won't have the sig on that post. 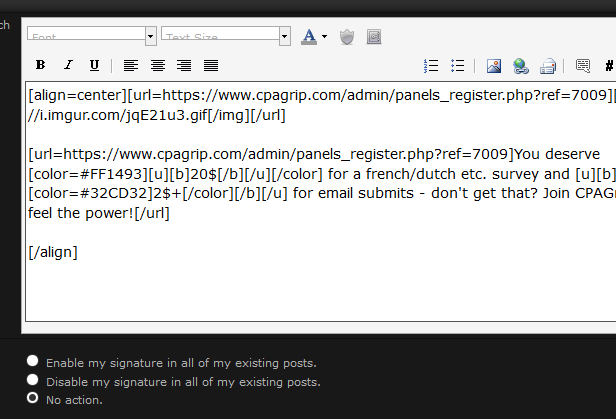 Even though it is clear that my check box was set on 'Enable signature on all existing posts'. What I have to do is always check this box again every time I make a new post, I think it wasn't like that before. So I manually have to go to my profile and hit that checkbox again for basically every post I make. Any advice is helpful, thanks. I want to know, when you create any new thread or reply, what is the value of "Signature: include your signature. (registered users only)"
Can you please show a screenshot as well ? No no, i need screenshot of your new reply and New thread. I've noticed this before too, just didnt want to post as id look like an idiot if it was my fault. Happened on this thread aswell. also happens on my own. (2016-06-30, 11:16 PM)#Realtalk. Wrote: I've noticed this before too, just didnt want to post as id look like an idiot if it was my fault. One more thing, just to let you guys know, we have disabled signatures in sub forum. --- The previous Admin --- found that in past those sections were abused and hence we removed them. I think you need to use : "Enable my signature in all of my existing posts" option and then press submit button . Hope it helps! We have disable signature in some sections, that is why you are not able to see them in some sections. In that section you referred, signatures are hidden.